Evidence of the creative work of faulting is everywhere for the keen observer exploring the Ingleborough massif. Just east of the tiny village of Feizor (SD789675) the well pronounced Feizor Fault runs between the North and South Craven Faults towards Stainforth. To walk along the uplifted ridge of Cove and Gordale (Great Scar) Limestone is an exhilarating experience, with Smearsett Scar giving the impression of being much larger than its modest 363 metres (1400 feet) would suggest. Looking along the line of the Feizor Fault: Great Scar Limestones marking the scarp, with Yoredale Limestones downfaulted to the left. Stephen Oldfield. 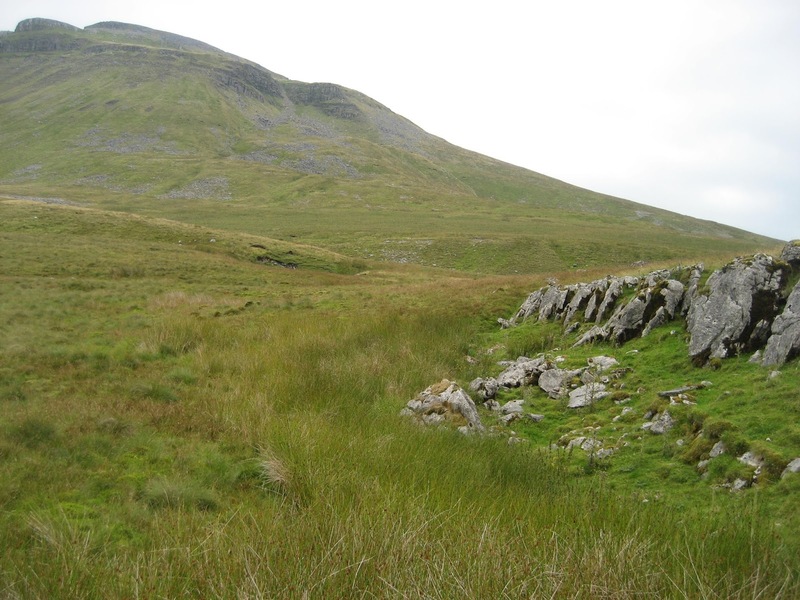 The limestone benches beneath Ingleborough’s steep western slopes are ‘riddled’ with faults, many of which influence the formation of the more famous potholes such as Meregill Hole and Black Shiver Pot. A massive fracture fault at Green Edge (SD727758) has lowered the bench to the north, and lifted it to the south by about 12 metres (39 feet) – enough to bring the Great Scar Limestones level with the Hardraw Scar Limestones of the Yoredale Series. Here, then, it is fascinating to watch the water rushing out of the Hardraw Scar Limestone and seeing daylight for a few seconds before disappearing into the Great Scar at Tatham Wife Hole. This impressive pothole then follows the fault for 1 kilometre , dropping to 155 metres (180 feet) in depth. 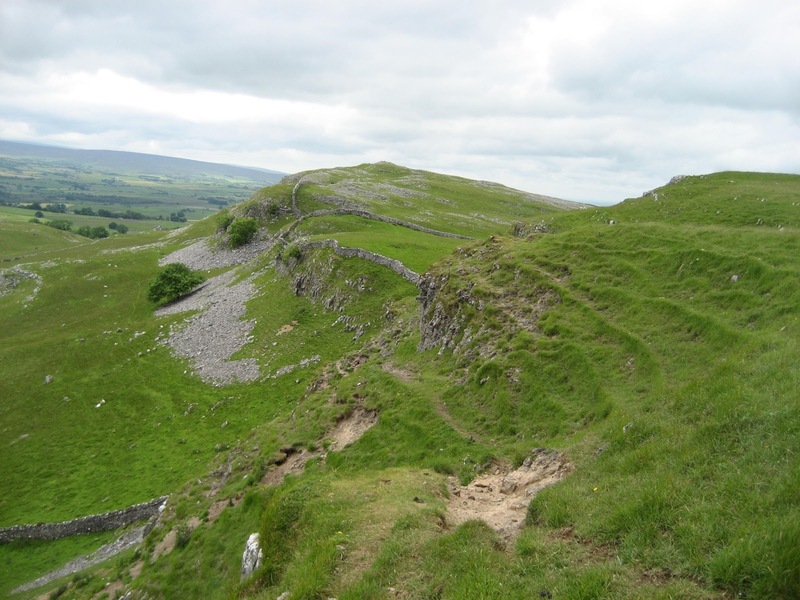 Some of the more famous examples of a landscape influenced by faulting occur at the various quarries in Ribblesdale, just north of Helwith Bridge. 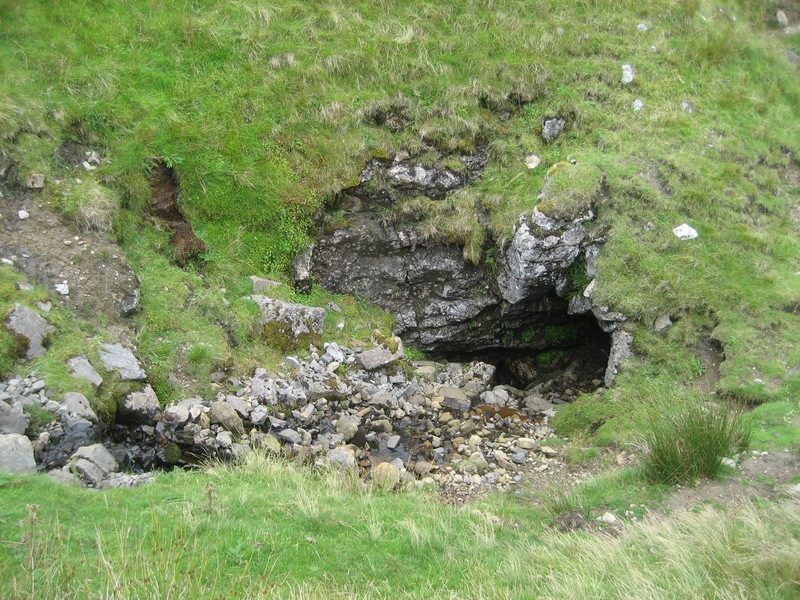 The uplift along the North Craven Fault has brought the ‘basement’ rocks of Silurian greywackes and siltstones close to the surface – segments of which have been revealed by erosion and glaciation. These rocks, between 450 and 410 million years old, have been exploited for flags and roadstone, further revealing their vertical alignment underneath the covering layer of horizontal Great Scar Limestone. 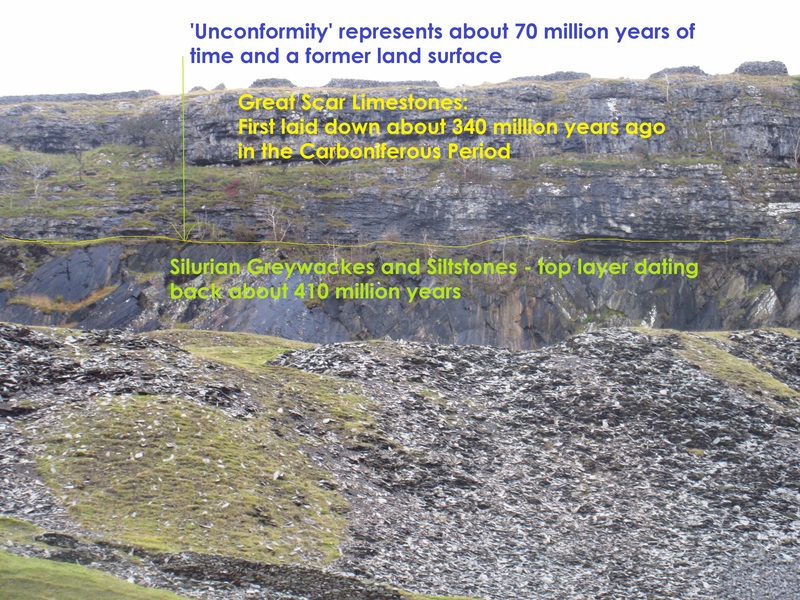 The gap then, between the last of the Silurian rocks and the first appearance of the limestones is an incredible 70 million years! The large gap in time between the two rocks is explained by the missing ‘in between’ period of the Devonian, when the Dales were mostly dry land with no rock formation taking place. 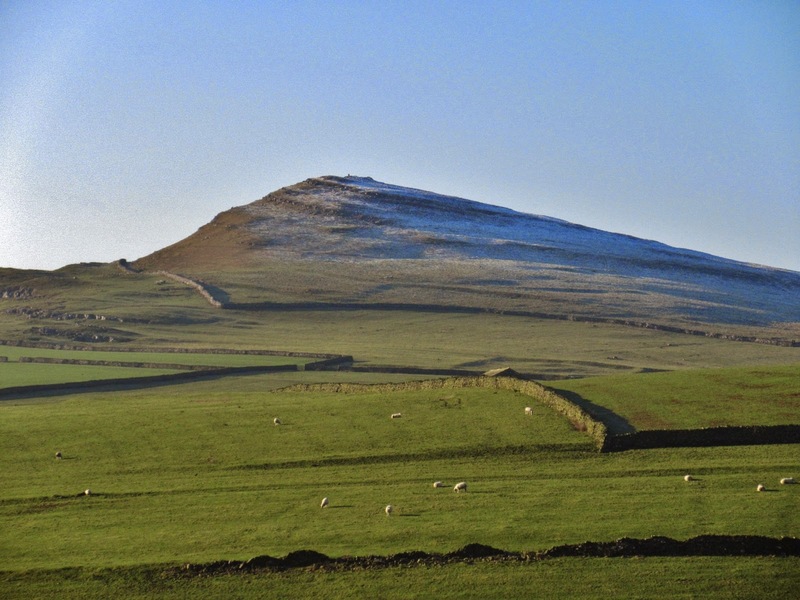 It is a classic example of a geological ‘unconformity’ that would never have been revealed so splendidly without the influence of the North Craven Fault.